Whether you are a timber investment management organization, a real estate investment trust, a forest or wood products company, a biomass facility/utility, a softwood/hardwood lumber mill, pellet mill or pulp and paper mill operator, LIMS is the full-featured system you’ve been waiting for. As an integrated system, LIMS requires that data be entered once and only once. The software uses a modern, centralized database design, so all your business information is available in one place in continual real-time. Your staff need only learn one, easy-to-use Windows-based system. With 3LOG’s maintenance and support agreement, you’re assured of continual updates to keep your software current with evolving regulations and practices in the forest industry, and with the ever-changing stream of developments in information technology. Fixed-price support and maintenance agreements make for easy budgeting and assured costs. LIMS is installed at over 500 locations throughout North America. Read on to learn why companies from single site mills to large, multi-divisional companies have selected LIMS as their primary business management software. LIMS supports timberland or woodland operations, inventory yards, and mills by providing total administrative support from a single, central database. With LIMS, you keep all your data in one place and in one system. From silviculture, harvesting, procurement, and hauling, through to yard inventory management and on to sales or consumption, LIMS manages your entire business. There’s no need to buy or build multiple systems to run your business, or to track down the information you need from multiple sources. The whole picture of your operations is in LIMS. With LIMS your staff need only learn and operate one system. No more duplication of data entry and no more time spent interfacing between different systems and tracking down discrepancies. Time previously spent working with cumbersome manual processes is freed up. Your team can spend their time using their professional skills rather than administrating. LIMS is equipped with a user-friendly Report Wizard that allows you to capitalize on your decision to go with an integrated system, where all your valuable information is stored in one database. With real-time operational reports, managers can quickly make decisions that control and reduce costs. LIMS lets you create reports instantly, with different templates for different users, divisions, and offices. You have the flexibility to do reporting at any time on demand, or according to a schedule you set up. No need to learn external reporting tools, or to call on specialized technical staff. You can write and run your own reports, directly from the database, using features built directly into LIMS. At the touch of a button you can also export data in reports to a Microsoft® Excel spreadsheet, an HTML web page, a plain text file, or many other formats. You can also print and email formatted reports. With a 3LOG support and maintenance agreement, your costs are fixed in advance. 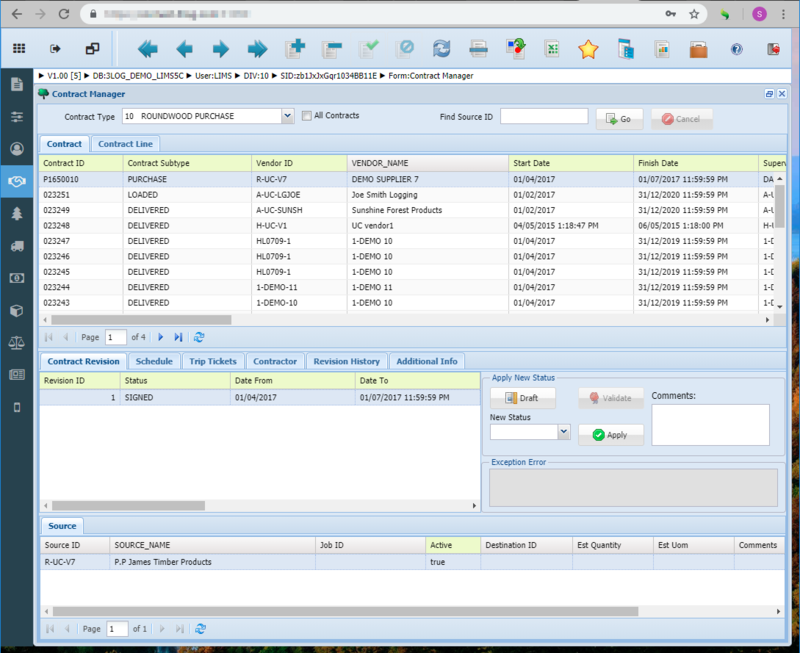 3LOG will do the work of adding new features to the system and keeping up with changes in database and operating system software. LIMS is highly scalable. With a central database design, our clients can combine all divisions in one central reporting system at the corporate headquarters. Alternatively, each division’s woodlands, timberlands or mill operations can be independent from all the others, each with its own database if preferred. With 3LOG’s approach, geographic boundaries do not stand in the way of applying LIMS across an entire firm. The more people in a corporation use 3LOG software, the bigger the benefits of integration in terms of efficiency and productivity.